* To change colors, fasten off with previous color and join with a sl st in the same space that you previously fastened off. * I usually weave in the ends as I go along so that I’m not overwhelmed at the end of the project. The squares are simple granny squares. * Use F (3.75MM ) hook and Red Heart Super Savor Yarn. Ch 6, join with a sl st in first ch to form a ring. Rnd 1: Ch 2, (counts as first dc), 2 dc in circle, ch 3, (3dc, ch 3) three times, and then join with a sl st in first dc. Rnd 2: If using the same color, sl st to the nearest ch-3 space. If using different color, join with a sl st in any ch-3 space. Ch 2, (2dc, ch 3, 3dc), ch 1. (3dc, ch 3, 3dc, ch 1) in each of the ch-3 spaces around. Jn with a sl st in first dc. Rnd 3: If using the same color, sl st to the nearest ch-3 space. If using different color, join with a sl st in any ch-3 space. Ch 2, (counts as first dc), (2dc, ch 3, 3dc, ch 1) in corner. (3dc, ch 1) in ch-1 space. *(3dc, ch 3, 3dc, ch 1) in next corner, (3dc, ch 1) in next ch-1 space. Repeat from * two more times and jn with a sl st in first dc. Fasten off leaving a little bit of a tail to sew one side of this square to the side of another square. *Make squares, sewing them together side-by-side, until there are enough to fit comfortably around your head, (I make 7 squares), then sew the ends of the last two squares together. I personally like to have a little bit of a rough look when sewing mine together, so I hold the wrong sides together and weave the yarn in and out of the inside/back/bottom loops only. Like…the loops that are closest together when holding the wrong sides together. *Use a size K hook. First Round: Work in the back loops of all the stitches possible and inside the actual chain if you’re working in the chain space. Jn desired color with a sl st into any right side corner of one of the squares. For a little wider, more spacious fit: Ch 2, *(dc in each of the next 3 st, dc in ch-1 space) twice. Dc in next 3 st, dc decrease using the last corner of the square and the first corner of the next square. Repeat from * around the strip. Jn with a sl st in first dc. Fasten off. For a more snug fit, and my preferred fit: Ch 2, *(dc in each of the next 3 st, skip ch-1 space,) twice, dc in next 3 st, dc decrease using the last corner of the square and the first corner of the next square. Repeat from * around. 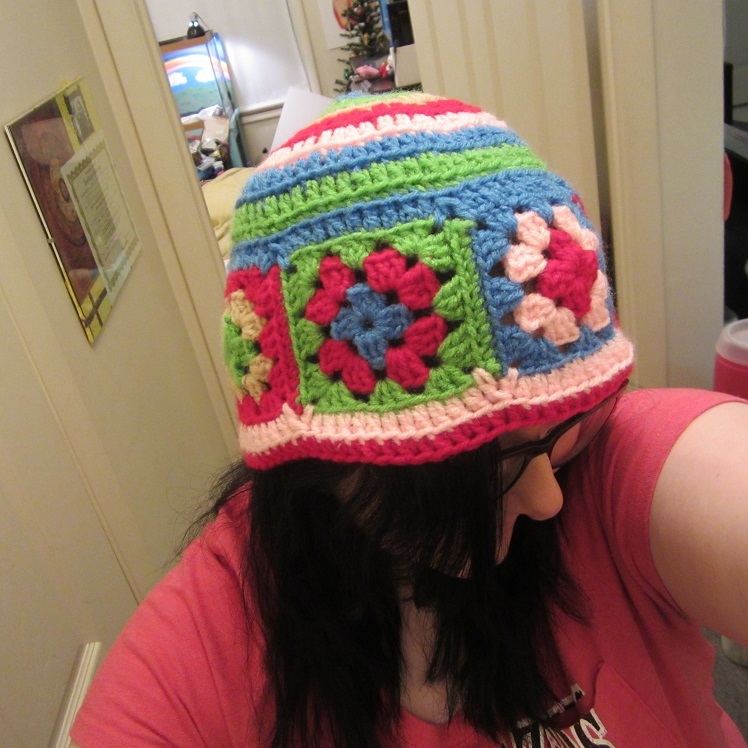 *The first side you work in this way will be the side you attach to the upper half of the hat once you make it. To make the bottom (open) end of the hat, you’ll flip the strip over and repeat. The fasten off leaving a tail long enough to sew this part of the hat to the top (crown) of the hat once you complete it. Second Round for bottom of hat: For the last round of the brim of the hat you’ll be working in the back (inside) loops all around. Jn with a sl st in the back loop of any st. Ch 2, hdc in next st and around. Jn with a sl st in the first dc. Fasten off and weave in ends. *Note: If you feel the hat is a little too wide, simply skip the two ch-1 spaces on each square and don’t work dc into those chains as you would for the ‘snug fit’ option above. *On the round after I switch colors, I like to work in the back loops only of the round with the new color, but this isn’t necessary unless you also like the little ‘line’ that appears as a result as well. * Sew the crown of the hat to the strip of squares with a yarn hook by weaving the needle in and out of the back (inside) loops. Fasten off and weave in ends. *Note: This is the basic way I make all of my hats. If you want a simple dc hat, you can repeat Rnd 7 all the way down until the hat is as long as you want it, even adding many extra rounds for a slouchy beanie. For a kid’s hat, work from Rnd 1 and stop when you get the hat just wide enough that you could skip down to Rnd 7 and repeat it until the hat is as long as you want it. For a kid’s version of this particular hat, you could even make only one or two rounds of the squares so they are smaller (or switch to an F hook for the squares only so you can keep the number of rounds and color combinations) and see how that works to tiny it up! 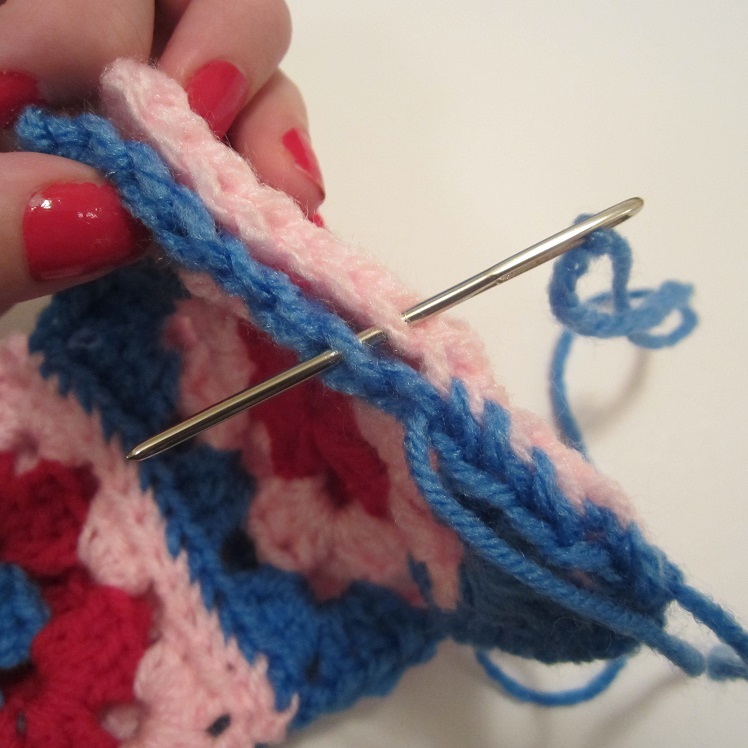 Make squares like the ones for the hat, only use a K hook because they can be larger. Make the squares and connect them until they are as wide as you want your cowl (or shoulder wrap) to be. 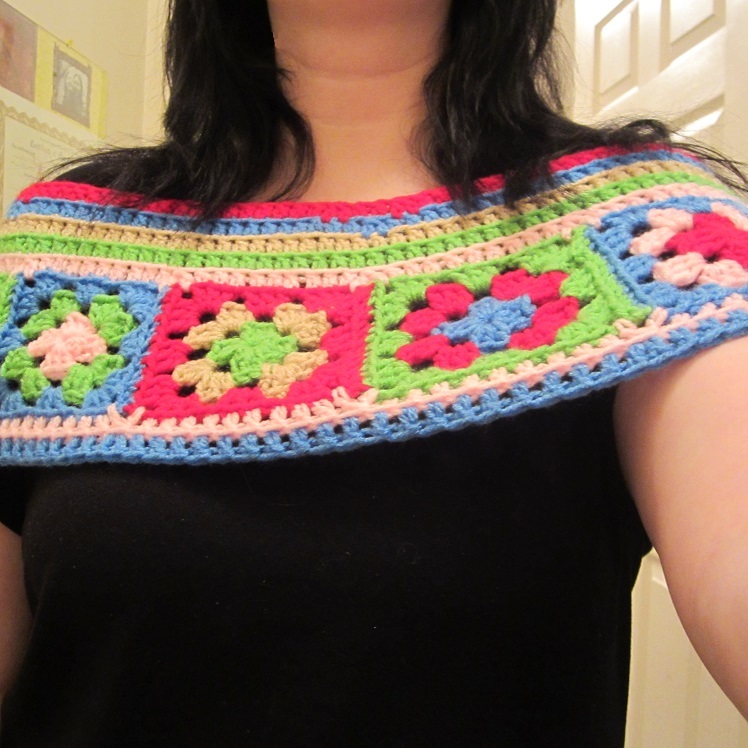 Then simply repeat double crocheting around evenly on each side of the square patch until cowl is as tall as you’d like. Example: Jn with sl st, ch 2, dc in next st and around, jn with a sl st in first dc to join round. Now take adorable pictures with your kitty cat!!! 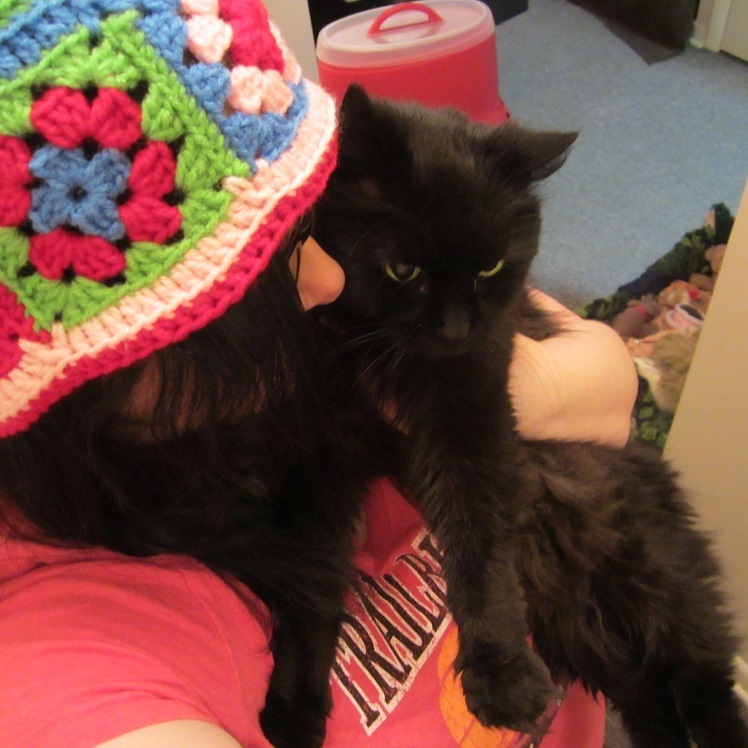 This entry was posted in Uncategorized and tagged colorful, cowl, Craftyghoul, crochet, elegant, free, Free Pattern, granny, hat, kitty, pattern, shawl, shoulder, shoulder wrap, spring, square, squares, staring, wrap. Bookmark the permalink.